Organisation isn’t one of my strengths and my logging of contacts has been pretty woeful. It consisted of a spiral bound note book full of various scrawls sometimes tabulated for contests but more often than not a free form mess. With good intentions I purchased a proper RSGB Deluxe log book months ago but that has remained pristine and has just become a handy band-plan look-up! Until recently I had only made a small number of voice QSOs on HF and had entered those manually into the online eQSL, QRZ and HRDlog logbooks I maintain. JT65 data mode logging was handled by the JT65HF program itself and for the UKAC and other VHF contests I have been using the MINOS logging program – all in all a bit of a mishmash. Now my operating confidence has grown I am making more contacts and so I really need to computerise and centralise my logging. After looking at a number of programs I opted to give Charlie Davy’s (M0PZT) freeware PZTLog a try and after using it for a couple of weeks I am very impressed. The program has a multitude of features but at the moment I am using it to simply enter and log details of contacts, combined with the CAT interface to the FT857-D and the OMNIRIG control the mode, frequency, band and power settings are automatically populated. The really nice selling point for me was the inbuilt data mode operation. 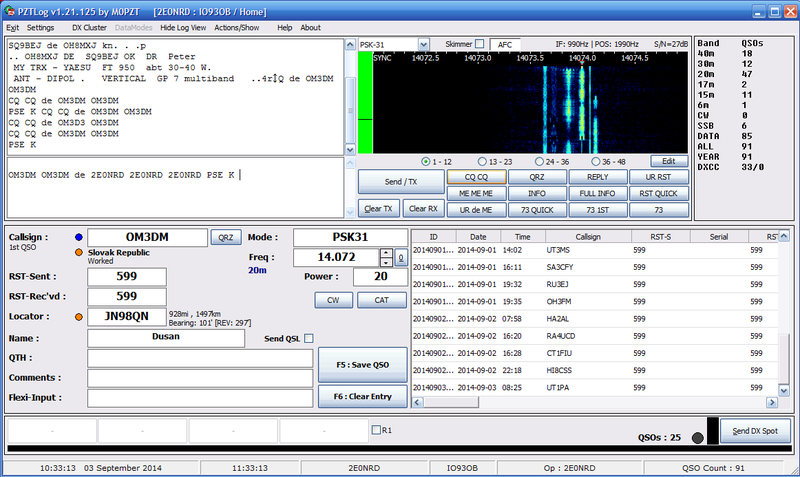 I have tried PSK and RTTY before using other programs but I often found myself confused and intimidated by the interfaces and jargon. PZTLog uses the MMVari engine to operate PSK/RTTY and it uses a familiar waterfall display. The TX/RX window and QSO macros are easily accessible and I found the interface much more intuitive than other programs I have used. On installation, the macros are already populated and labelled sensibly and are easily editable. By double-clicking received text you can set Callsign, Locator, RST/Serial, Name/QTH quickly and with ease. In a short time I have made a good number of PSK QSOs as well as a some RTTY contacts, even giving some points away in the fast paced SCC RTTY contest last weekend. Importing and exporting of logs is very easy and it has inbuilt eQSL uploading, but at the moment I am having trouble making that work reliably but that I think is me rather than the program. PSK is a great mode, running no more than 30W, often less I have made a number of nice DX contacts and countries including Argentina, Oman, Japan and the Dominican Republic. Thanks to Charlie’s program I now have a better understanding of how the mode and QSO works so may try some of the more sophisticated programs, or I may just stick with PZTLog for a while. Check out Charlie’s page for lots more interesting information as well as some very funny light hearted audio features poking fun at the hobby. In other news the VHF UKAC contesting is improving. Last week I made a last minute decision to lower the pole and put up my homemade wooden 6m MOXON but glad I did. Conditions weren’t good but still made a respectable number of contacts but not a lot of distance. I’ve climbed to 30th place in the 50MHz low power AL section. Last night was the 144MHz UKAC and what a great night it was, conditions were brilliant and it was very busy on the band. Still operating search and pounce mode I snagged just 32 contacts, but with 13 multipliers giving me by best score so far on that band. Operating in the low power AL section as M6GTG it is hard work getting through the pile ups but it was great fun trying. Finally I became a licensed ‘foundation level’ amateur a year ago this month (M6GTG), and have since become an ‘intermediate’ (2E0NRD) and have now taken the bold step of applying to take the ‘advanced’ examination next month. I say bold because I haven’t taken a course or studied for it per se but with my background and education I have covered most of the theory even if it was over 25 years ago – with a bit of serious reading, revision and dusting off of the memory banks over the next few weeks I hope to be ready! I have been busy again, got lots of interesting stuff to post when I find the time.. 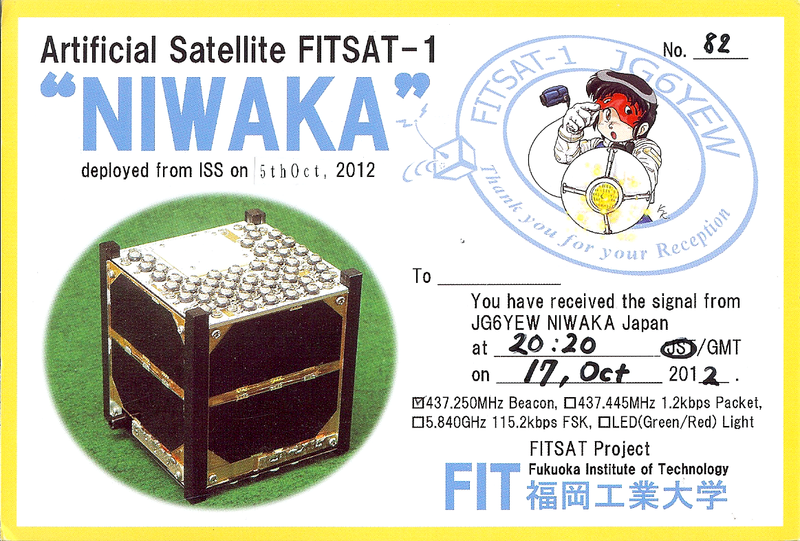 In the meantime, this arrived last week my first ever QSL card!